On this episode of Working: Syracuse, we chat with doulas Sherri Morris and Christine Herrera. They started working together in 2016 after meeting each other within the Doula Connection of Central New York, a collection of six doulas who offer everything from birth to postpartum, antepartum, and breastfeeding support along with childbirth education, placenta encapsulation, and prenatal yoga. After meeting, the two women realized the long hours required of the job would be better tackled together, and they created a collaboration that delivers much satisfaction even as it demands time sacrifices because of the intensity — and unpredictability — of pregnancy. Morris and Herrera travel to different homes in the area to meet with expecting mothers looking to gain confidence and encouragement through one of the most remarkable moments in a woman's life. By creating a personal connection with their clients, the two women develop an understanding of each mother's needs and alleviate those mothers' fears about birth by listening, researching, and advising. In fact, one of the biggest parts of the job is staying up to date on the latest medical information and studies related to pregnancy and labor. For example, a recent study from the American College of Obstetricians and Gynecologists prompted the revision of guidelines for postpartum care, calling for earlier and more frequent check-ups. Morris and Herrera work to stay on top of the medical literature and adjust rapidly to ensure their clients understand and follow best practices. "There are times when we'll call each other after a birth and just totally decompress. Because it's hard work, and it's really emotional work," says Sherri Morris, one-half of the Doula Chicks. 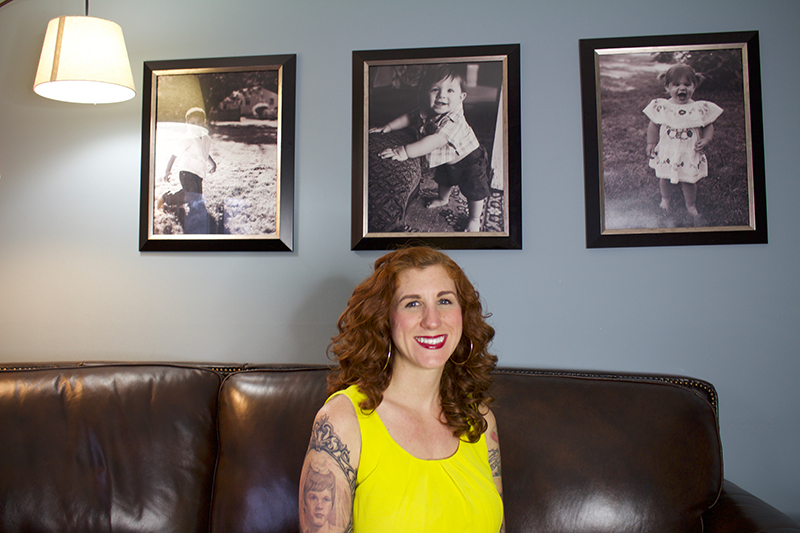 Christine Hererra sits under a collage of photos of her three children. Although being on call makes it tough for her to commit to family functions, she says her family is always there for her and supports the occupation she chose. 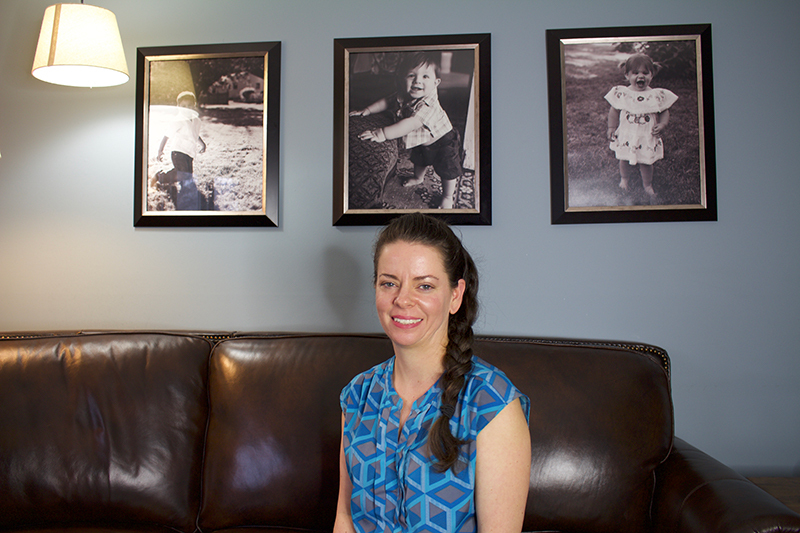 Morris, sits under family photos in the home of her business partner Herrera. The two work as a doula duo, and Morris says she spends more time with Herrera than she does with her husband. Paige Brodock, a Doula Chick client, and her 10-day old baby enjoy a feeding break. Breastfeeding support — along with postpartum and antepartum support and childbirth education, placenta encapsulation, and prenatal yoga — are some of the services provided by the pair. On this episode our reporter Jessica Gorman spoke to Sherri Morris and Christine Herrera — also known as The Doula Chicks. Working as a team, which is uncommon for their profession, Morris and Herrera assist women through every stage of pregnancy — from as early as 16 to 20 weeks to the night of the birth, depending on what the expectant mother wants and needs their services. For both Morris and Herrera, the joy comes from building relationships with other women as they guide them through pregnancy. SHERRI MORRIS: Throughout history, up until maybe 100 years ago, women supported women in birth. So when you were pregnant, the village midwife or your neighbor. There might be several women who would come to your house—some to take care of your kids, some to help you during the birth process. Probably about 100 years ago or so maybe a little longer, birth moved from the home to the hospital and we don't see birth. JESS GORMAN: Sherri Morris walks gently around a well-kept Cazenovia home, with her client's baby in her arms. She coddles the child lovingly as if she were her own. Before settling into a chair, Morris hands the 12-day-old back to the affectionate mother; shifting her attentive green eyes to the floor, it dawns on her that she won't be in this child's life much longer. SHERRI MORRIS: I had a client last summer who, the mother was like, "Do you think I could just keep you until she’s 18?" Well, I would love that but... it's funny though because you see the babies and they don't recognize you and you're like "awwwww." JESS GORMAN: Raising four children of her own, Morris is sensitive to the needs of new mothers. Understanding their concerns and adapting to their requests, she often draws on the difficulties she's faced during pregnancy to aid and comfort her clients. SHERRI MORRIS: Sometimes things that happen in a woman's labor, it would trigger an emotional response for me, because it reminded me of my own births. So it was a lot of processing my own births in the beginning. JESS GORMAN: Morris sits up straight, perched on the brow of the chair with her long black hair in a meticulous ponytail. She concentrates on the new mother, seeking to anticipate a need. She cares for her client with great precision and empathizes with women and the pain they navigate through pregnancy. So much so that her own aches during pregnancy hindered her ability to keep up with the job. SHERRI MORRIS: I get really sick and really tired when I'm pregnant. I have a lot of physical pain I couldn't do it. So I just took two years off. JESS GORMAN: Chris Herrera is Morris' business partner, but while caring for her three children, she took a different approach to being a doula. CHRIS HERRERA: My third birth, I was at a birth for a previous client that I had worked with already and were due at the same time. So I had a doula, an extra doula come in for me. So there were two doulas there to help me just incase her birth was long or something and she could help me or help the mom. It all worked out. JESS GORMAN: As Chris comfortably rests her arm on the back of her client's couch, she explains breastfeeding techniques. Her long, curly red hair and blue eyes match the colorful tattoos displayed on her arms. She is fond of the tattoo that features their business logo—three teal and yellow birds, symbolizing her commitment to being a Doula Chick. CHRIS HERRERA: Nobody understands what it really is like to be on-call until you've lived it. How many things we have missed, family wise and friend wise. Or I had to leave in the middle of my child's birthday party. It's like, "Mommy where are you going?" That's the job. That part is hard. Not many people understand that. JESS GORMAN: Herrera and Morris realized their resources could be more effective and efficient if they combined their talents and created a new business model for themselves as the Doula Chicks. CHRIS HERRERA & SHERRI MORRIS:I'm Chris Herrera and I'm Sherri Morris and we're the Syracuse Doula Chicks. JESS GORMAN: After meeting through the Doula Connection of Central New York in 2015, they began working together in January of the following year. Morris admits that relying on each other not only helps them take on new clients, but also gives her emotional support to better serve new and expectant mothers. SHERRI MORRIS: There's times when we'll call each other after a birth and just totally decompress. Because it's hard work, and it's really emotional work. JESS GORMAN: Pregnancies, births, and babies inspire a lot of emotions from all involved. Entering that landscape requires Morris and her partner to be attuned to those emotions and know how to handle them. SHERRI MORRIS: They are inviting you into one of the most intimate moments of their life. So they need to feel comfortable with the person that they are inviting into that space. Because birth is really mental and emotional. It's physical but it's actually a lot more mental and emotional than physical. And if you're not feeling comfortable with a person that is in your birth room, it can really hinder your labor. JESS GORMAN: Pregnancy has its challenges at every stage and shows up differently in every woman each time. The most common mental ailment, postpartum depression, happens after the baby is born. But as Herrera points out, many women suffer from a known mental illness even before birth. CHRIS HERRERA: We have a lot of women that have anxiety through their pregnancy. So I think it's more common than you actually think. That's definitely a big role of what the doula does prenatally—educating them on the process and what to expect so that way they're aware ahead of time before they actually get into labor. And then really talking through all of their fears and how we can work around those fears and make it more of a calm and soothing environment for them. So that way, it's already set in place before the woman actually even goes into labor." JESS GORMAN: To facilitate healing conversations, Herrera creates a comfortable space for the women to ask questions and share their fears about motherhood. This process helps ease mothers' worries as they move into parenthood. CHRIS HERRERA: We have taken multiple trainings and because this is our profession. There are some doulas that are more of like a hobby type of work. This is definitely our career. This is what we do every single day. Day in and day out we are doing something doula work related. JESS GORMAN: Along with all their certifications, it is important for the two to be well versed on the latest information. With the internet's circulation of misguided insight, it makes it harder for women who try to decipher what diagnoses are worrisome or just nerve-wracking. Morris encounters many women suffering from intense stress, even before knowing what labor is actually like. SHERRI MORRIS: First time around especially, it's like so unknown. You don't know what to expect and maybe you have some fears. Or feel anxious about birth. Once they've gone through it once or twice, they say, "Oh, I know what to expect now." It's not so fear inducing for them or doesn't make them as anxious. Then the next time around they make different decisions, or have a different plan for their birth, So that's kinda interesting too—to see women evolve and their comfort around birth. JESS GORMAN: Even though they reassure women that birth is not something to worry about, the two realize that miscarriages and stillbirths are extremely common. Morris is one of a few doulas able to counsel mothers who are faced with a fatal dilemma. SHERRI MORRIS: I am trained to actually, although I've never used this training, but I am trained to support families who have had a fatal diagnosis or the baby is very sick and the mother knows ahead of time. Or the baby has died when she was pregnant. I think, I can imagine in my head how I would support a woman in that way. Just giving her options. You don't really want to think about these things happening. But a lot of women don't know that if their baby dies, like a stillbirth when they're pregnant or will be dying shortly after the baby is born, they can actually have the baby in the room with them during the duration of their stay. So the family members can come in and see the baby, meet the baby and say their goodbyes in the room. SHERRI MORRIS: I feel really passionate about this and I feel really called to this and I'm going to continue to stick with it. JESS GORMAN: Once a baby is born and all questions have been answered in a postpartum visit, the work of a doula ends. But Herrera and Morris's connection with their clients continues to grow. Herrera typically grabs a bite to eat and catches up with former clients, watching their children grow along the way. CHRIS HERRERA: It's great when you keep that connection though. I have worked with a family for 18 months and we still now do lunch dates every couple of months. And it's never going to stop. I just love them. JESS GORMAN: The Doula Chicks take pride in their work and are only fully satisfied with their job once they can see their clients happiness with the choices they have made themselves. To Morris, it is all about empowering women to let their voices be heard, ultimately creating a positive connotation around the word "doula." SHERRI MORRIS: We just want them to be happy with their birth outcome. So when a woman is in control of those choices, when there's deviations from their birth plan or changes, when they're the decision makers in that process that's when they feel the most empowered in their birth experience. BRONTE SCHMIT, HOST: Thanks Jess. The Doula Chicks do much more than your typical doula. Herrera actually converts the placenta into pills for mothers if they so desire. They claim an energy boost for mothers when they take the pills but the science doesn't quite back it up. BRONTE SCHMIT, HOST: That's all for this episode of Working: Syracuse. Check out our website www.workingsyracuse.com for more interviews as well as some extra content on Herrera and Morris. Be sure to follow us on Facebook and Twitter @WorkingSyracuse. Thanks again to Jess for speaking with Herrera and Morris. This episode was written and produced by Zac Palmer. Our theme music was by Logan Piercey. I've been Bronte Schmit. It's time for us to clock out.